So rather than Caped Crusaders how abut we go all Female on this. So for the first blog post on comics in a while, I’m going all Buffy the vampire slayer on this joint. 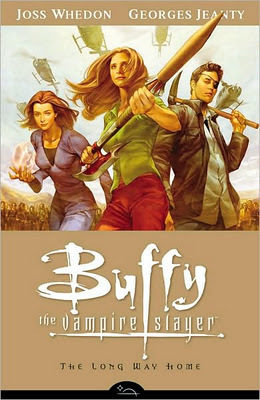 After the cancelled Buffy and finished Season 7, they weren’t quiet finished with the franchise yet. So Season 8 the comic book series was born, which is a direct continuation of the television series that pretty made up a massive chunk of my teenage years. The Long Way Home continues the Buffy story a year on from the finale that was season seven. The “one Slayer” has now raised an army, and having exploded Sunnydale and well everything around it the Scoobies and the 100’s of new slayers have massed together in Sunny ol’ Scotland to train in peace and quiet…. Or so they hope. Oh and Dawn, remember her, she’s a giant now <_< Just saying. Season 8 originally ran from 2007 - 2011 and contained two stories, one loooooong one and one short. Everybody's favourite writer Joss Whedon". The Long story serves mainly to demonstrate that nothing has changed in Buffy's world. Old Enemeies, old faces. It serves to explain to the reader how things are done in "Buffy-verse". I'm not saying that as a bad thing, "The Long Way Home" is very faithful to the television series, the experience is intermittently thrilling and quick witted, it's fresh, funny and exciting and it isn't bad looking ether ; ). The Artist Georges Jeanty is one of the main artists, I feel he draws the Scoobies very well, makes them look all grown up and recognisable. The One main problem with the Buffy comics is this, it relies a little too much on having a good knowledge of the Buffy-verse, it assumes you were a fan of the tv series and know lots of little details. I'm one of those people, and I can see how some of the big bads and events might pass anybody by without s much of a second thought. I probably wouldn't recommend this to anybody who has not at least watched the old series. With such incredible new avenues for the series to explore, as it surely should, and Whedon in fine form - and moreover seemingly in control of where Buffy the Vampire Slayer: Season Eight goes, now that it needn't be about the same old Scoobies year in and year out - The Long Way Home makes for a fantastic start to an alarmingly smart comic book based on an alarmingly smart television series. Welcome home, folks!